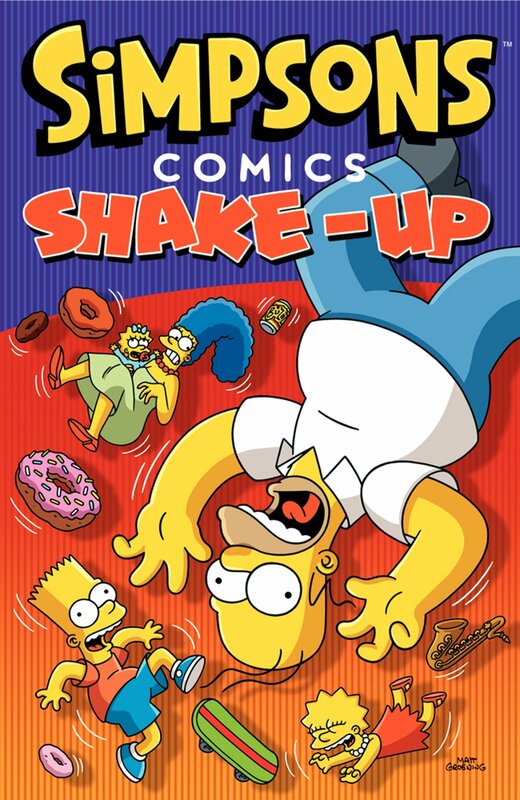 Simpsons Comics Shake-Up is a Simpsons Comics compilation book, that was released on February 4, 2014. "Everyone's favourite dysfunctional family is back in a brand new collection of wild and hilarious adventures, including all-new stories featuring some of the cast's fan favourite characters. Join Homer, Bart, Marge, and others as they shake off the status quo when they take the show on the road with a musical extravaganza produced by maestro of renown, Krusty the Clown. Then, Dr. Nick's cosmetic quackery is called into question, but the 'good' doctor may serve a purpose in the shaky medical establishment that few are willing to admit. And after winning a law license in a bar bet, Homer becomes the hottest lawyer in town, but it is not long before Homer is fending off the FBI, only to find himself in a federal prison surrounded by former friends and foes and facing a shakedown!" Modified on June 22, 2018, at 23:08.